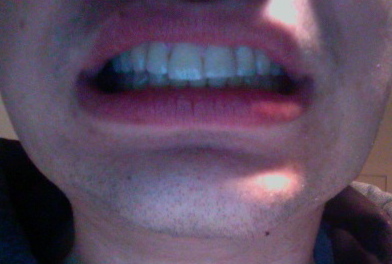 As I mentioned last weekend, my jaw has healed in such a way as to compromise my facial symmetry. As promised, here are some more details. Note that all of the photos here, like most photographs, are mirror images. The asymmetry is least obvious when my mouth and lips are closed. My chin looks a little bit slanted, but my lips look fairly normal. 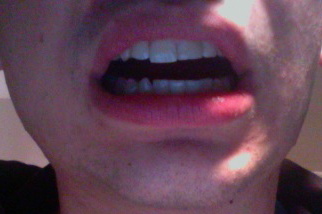 When I open my lips but leave my teeth together, the asymmetry becomes a little bit more visible. 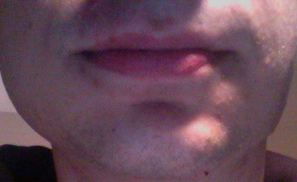 My lips open a little bit further on the right side than the left side. It becomes more obvious as soon as I open my teeth. 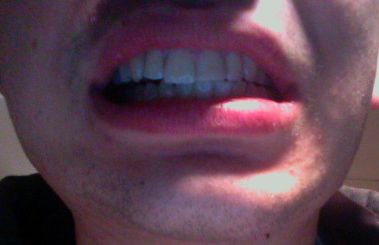 My lips open significantly further on the right side than on the left side, and my repaired teeth are smaller than my natural teeth. …and then to the right. 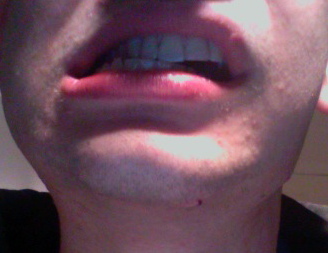 No, I didn’t upload the wrong photo for that last one, I just can’t move my mandible visibly to the right. 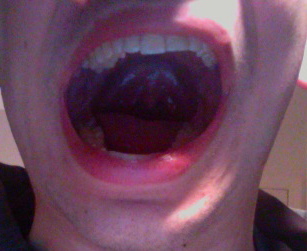 Finally, here’s my wide open mouth. The picture’s a little bit deceiving because my head isn’t quite straight, but there is some serious asymmetry. My mouth opens considerably wider on the right side, and this is visible not only in my slanted chin, but the different amounts of tooth visible on the left and right side. Unlike some of the other little remaining signs of the accident, this isn’t something I expect to go away. I’ve read much of a study (subscription required) by Edward Ellis and Gaylord Throckmorton in the Journal of Oral and Maxillofacial Surgery found that patients who had condylar mandibular fractures treated by closed methods developed shortening of the face (measured from x-rays of the facial bones). Ellis and Throckmorton found that asymmetry in patients with closed treatment tended to increase somewhat over time rather than decrease. One caveat is that their study didn’t include any patients treated by maxillomandibular fixation (MMF) as I was, but they speculate that patients whose jaws were wired might develop even more asymmetry than the ones in their study. Thus, I don’t think this asymmetry will be going away unless I should fracture the right condyle.